Ducks are amphibious landing craft that the military used during World War II. They are support vehicles that were used to transport troops and supplies from ship to shore. Ducks were used in both the European and Pacific theaters of World War II, and the name duck is derived from an army acronym (D.U.K.W.) that stands for the following: D = 1942, the first year that ducks were first manufactured; U = Utility Vehicle; K = All Wheel Drive; and W = Twin Rear Axles. 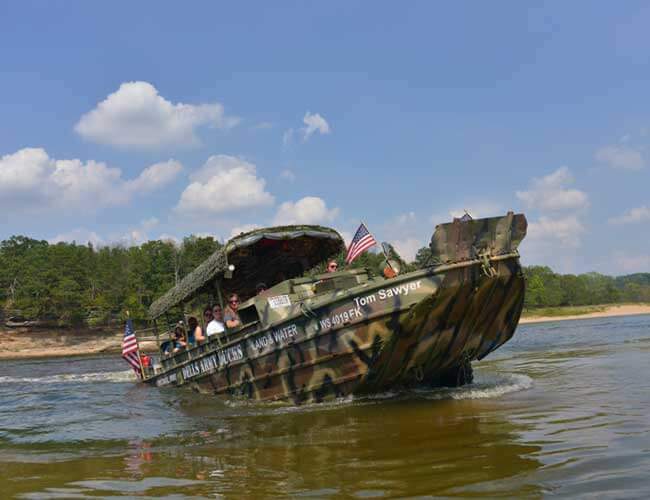 Weather permitting; Dells Army Ducks operate from Mid-March through Mid-November. 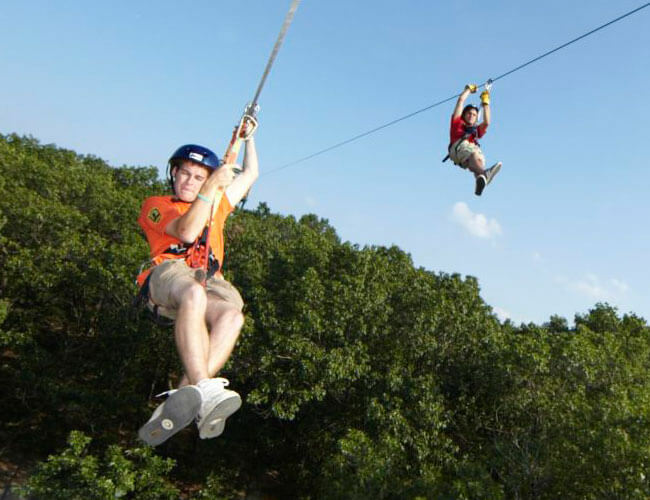 Our gift shop and the Bigfoot Zip Line are open all-year-round. Are snacks and beverages allowed on board the Ducks? Yes, you can bring snacks and beverages purchased at the Snack Shop and Tiki Bar on board the ducks. We have a Snack Shop and a Tiki Bar at the facility, and you may purchase water, soda, alcoholic beverages, food, snacks and candy. Please remember that the duration of the tour is 1 hour, and there’s no restroom on board. Please remember to use the facilities before your departure. The ducks are an open-aired tour, so please dress accordingly for the weather on the day of your tour. Tours depart daily rain or shine! However, in cases of lightning and severe weather, we’ll then suspend operations until the weather passes and the tours can resume. Ducks are all equipped with canopies and plastic curtains, however, you’ll most likely get wet if it rains during your tour. Are the ducks handicap accessible? Yes. The entire facility is handicap accessible; however, everyone must sit in their own seat. This means that someone that uses a wheel chair simply transfers into their own seat on the duck. Assistance is available to help passengers in these situations. Wheel chairs and walkers stay on the dock while passengers complete their tour, and they’ll be waiting for you at the arrival dock. Service animals and small dogs are allowed on the ducks. Please inform us of your plans to bring an animal on your tour when making your reservation so that we can save an extra seat. No, not on board the duck itself, but right up to the point of loading on your duck is fine. Your stroller will be waiting for you at the arrival dock. Car seats do not work well on board the ducks, so we don’t recommend them. Car seats are not prohibited, however, parents that simply hold their small children during the tour have a much nicer experience. The inside of the duck looks a lot like a school bus, with bench-style seating and two per seat. There are no seat belts on board the duck, so we don’t recommend car seats, but you’re welcome to bring a small baby carrier for the very young. All guests need a ticket whether they are 3 months old or 103 years old, so no matter the age of the child, a seat will need to be reserved. No. There are no bathrooms on board the duck itself, but there are facilities to use just before stepping on board. Therefore, we recommend using these facilities just prior to your departure. You can book online or give us a call at 608-254-6080, and we’ll gladly assist you in the process. When calling, please be ready to provide contact information, number of adults, number of children ages 4 – 11 years old, number of infants, and a credit card to book your reservation. Once you arrive at Dells Army Ducks, 1550 Wisconsin Dells Parkway, please visit the ticket booth, state your parties’ name, and your tickets and receipt will be printed at this time. How early should we arrive and when do the Ducks depart? The answer to this question varies. Ducks depart when they’re full, so it depends on when you arrive, and how busy we are. Passengers arriving during the busy season from Memorial Day until Labor Day are usually on a tour in 10 – 30 minutes after receiving their tickets. Memorial Day to Labor Day hours are from 9 a.m. until 6 p.m. It slows down during the pre and post season where the hours are from 10 a.m. until 4 p.m., and passengers are typically on their tour within 30 – 45 minutes after receiving their tickets. Please call (608) 254-6080 for more accurate information based upon historical trends. What’s on-site at Dells Army Ducks? Our facilities are new as of the 2010 season. There’s a spacious passenger seating area, gift shop, snack bar, Tiki bar, male/female and family restrooms. The passenger seating area is a common area where passengers await the duck rides, jet boat rides and our zip line. Like the ducks, our other tours are excellent. Please ask about combination fares to save, because the more rides you take the better your deal. Get more information on Epic Mix Packages. There are no refunds once you’ve purchased tickets. Tickets are valid until used, so you may reschedule to another time, or gift them to family or friends that are coming to the Dells. Cash, American Express, Visa, MasterCard, and Discover cards are acceptable methods of payment. A jet boat is a low-draft boat that’s propelled by impeller jets driven by inboard motors. The impellers draw-in water from underneath the boat and then ejects it out the nozzles in the back. This configuration allows for quick maneuvering, power stops, and 360º spins. When is Jet Boat season? 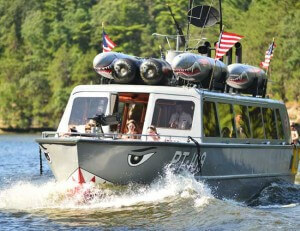 WildThing Jet Boats operate from Memorial Day – Mid October. Depending on the weather and water conditions, call (608) 254-6080 for our fall schedule. Our gift shop and the Bigfoot Zip Line are open all-year-round. Are snacks and beverages allowed on board Wildthing Jet Boat? Yes, you can bring snacks and beverages purchased at the Snack Shop and Tiki Bar on board the Jet Boats. We have a Snack Shop and a Tiki Bar at our facility, and you may purchase water, soda, alcoholic beverages, food, snacks and candy.Please remember that the duration of the tour is 1 hour, and there’s no restroom on board. Please remember to use the restrooms before your departure. What is the weather like in Wisconsin Dells and how should I dress? When the weather is cooler, during May and September, we suggest that you dress warmly or in layers. During the warmer months from June through the middle of September, passengers typically wear bathing suits, shorts, tee-shirts and sport sandals. Be prepared to get wet and dress according to your comfort level. Clothing that will dry easily is best. Jeans and leather footwear are not recommended. You may bring items that you don’t mind getting wet. 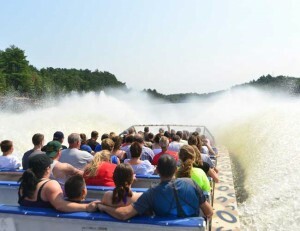 Passengers sometimes get very wet, because getting splashed is inherent to riding on a jet boat. We suggest leaving personal items locked in the trunk of your car. We do not accept responsibility for water damage to items you bring with you on the tour, including, but not limited to: cell phones, key fobs, cameras and other items. Electronic items you bring with you are at your own risk. There are plastic bins at your feet on the boat where you can place electronic items. Do I need cash and credit cards? Are handy things to have for gratuities, and to purchase beverages. Is there an age limit and other physical limitations to ride? Just about anyone can ride the jet boats, with the exception of very small children, pregnant women, and others having physical limitations like back injuries. Typically, when a child reaches 4 years old, and 43 inches tall, they’re now OK to ride the jet boats. Are the jet boats handicap accessible? Yes, however, everyone must sit in their own seat. This means that someone that uses a wheel chair simply transfers into their own seat on the jet boat. Assistance is available to help passengers in these situations. Wheel chairs and walkers stay on the dock while passengers complete their tour, and they’ll be waiting for you when you return. Please call (608) 254-6080 so that we can make accommodations for handicap passengers. All seating is managed by your captain and staff. Our top priority is safety and performance of the jet boat. Therefore, your captain and other staff will seat passengers according to weight, and number of passengers in your group. Small children are not permitted in the first two rows. Every attempt will be taken to keep your group together, but we do reserve the right to reseat passengers based upon the sole discretion of your captain. No. However, there are bathroom facilities at your point of embarkation. Please use the facilities prior to getting aboard. 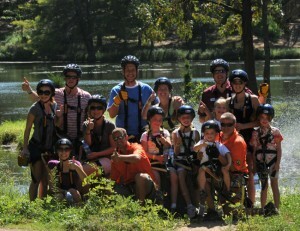 You can book online at wildthingjetboat.com or give us a call at 608-254-6080 and we’ll gladly assist you. When calling, please be ready to provide contact information, number of adults, number of children, and a Credit Card to book your reservation. Once you arrive at WildThing Jet Boats, please visit the ticket booth, state your parties’ name, and your tickets and receipt will be printed at this time. How early should we arrive to check-in? We ask that all passengers check in 25 minutes prior to a trip. This allows enough time for check-in and orientation of the facility. On site we have a new facility, Gift Shop, Snack Bar and Tiki Bar that are loaded most anything you’d like available while on vacation. There is outdoor seating to enjoy snacks and drinks with family and friends. 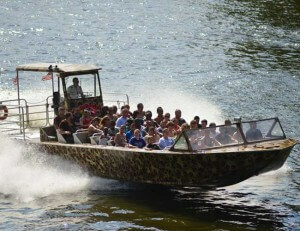 WildThing Jet Boats operates with the Dells Army Ducks and the Bigfoot Zip Line. You’ll be able to view these rides prior to embarking on your jet boat, please ask about our combination packages as you receive discounts that follow the principle – “the more you do, the more you save.” Get more information on Epic Mix Packages.